University of Delaware chemist Joel Rosenthal is driven to succeed in the renewable energy arena. 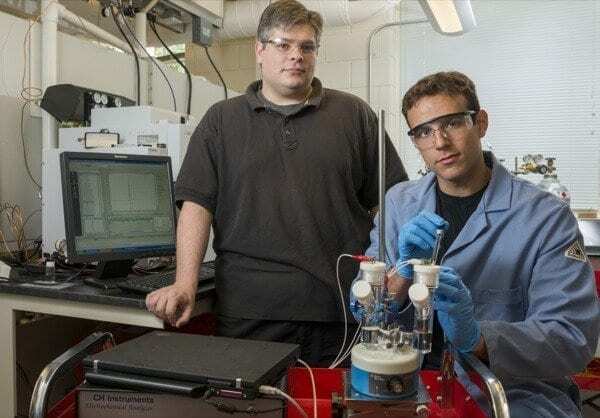 Working in his lab in UD’s Department of Chemistry and Biochemistry, Rosenthal and doctoral student John DiMeglio have developed an inexpensive catalyst that uses the electricity generated from solar energy to convert carbon dioxide, a major greenhouse gas, into synthetic fuels for powering cars, homes and businesses. The research is published in the June 19 issue of theJournal of the American Chemical Society. Gold and silver represent the “gold standard” in the world of electrocatalysts for conversion of carbon dioxide to carbon monoxide. But Rosenthal and his research team have pioneered the development of a much cheaper alternative to these pricey, precious metals. It’s bismuth, a silvery metal with a pink hue that’s a key ingredient in Pepto-Bismol, the famous pink elixir for settling an upset stomach. An ounce of bismuth is 50 to 100 times cheaper than an ounce of silver, and 2,000 times cheaper than an ounce of gold, Rosenthal says. Bismuth is more plentiful than gold and silver, it is well distributed globally and is a byproduct in the refining of lead, tin and copper. Carbon monoxide is used industrially in the water-gas shift reaction to make hydrogen gas. It also is a prime feedstock for the Fischer-Tropsch process, which allows for the production of synthetic petroleum, gasoline and diesel. Commercial production of synthetic petroleum is under way or in development in a number of countries, including Australia and New Zealand, China and Japan, South Africa and Qatar. Rosenthal says that if carbon dioxide emissions become taxed in the future due to continuing concerns about global warming, his solar-driven catalyst for making synthetic fuel will compete even better economically with fossil fuels.